Peer, how did Snapcardster come about? Snapcardster was founded in March of 2016, but the idea behind the app is older. I started playing Magic: The Gathering over five years ago, in the middle of the first boom period for smartphone apps. As a Magic player, I tried every app that had anything to do with the game. To me, none of them seemed well-designed or provided the features I was looking for, leading me to combine multiple apps and transpose data by hand. Which specific features were you looking for? No platform had been able to display the value of a Magic collection correctly and at a glance. Most players would probably be able to give a rough estimate of how many hundreds or thousands of dollars their collection is worth, but knowing specifics requires precise day-to-day data. For a long time, I managed my collection in Excel, but that is time-intensive. Without dynamic prices, it’s also impossible to track how the collection changes in value. How much did I originally pay for this card? How valuable is it today? This kind of information was important to me, because I personally like trading with other people. I imagined being able to define cards as wants and haves in order to trade with friends or at my local store. I often saw my friends order cards online of which I had spares lying around at home. Wouldn’t it be better to save time and money and see that a friend can trade or borrow you these cards instead of buying and shipping them? Managing and trading cards – it’s hard to imagine these features didn’t exist on the market before. At least not with scan and import features that help users migrate their collection to the app. To my knowledge, there are three other scanner apps on the market right now. There are numerous card management programs for PC and smartphone out there as well. But the total package which I myself wanted as a player was not available. So we had to develop it ourselves. After all, if you don’t want to use your own product, it’s not a good product. And how did this initial idea become a start-up? 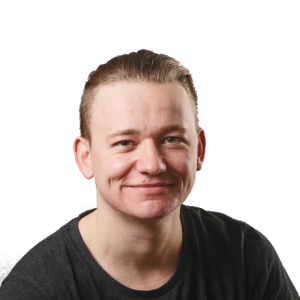 In 2014, I founded my first start-up while studying Business Informatics at Kiel University: Bordifies. 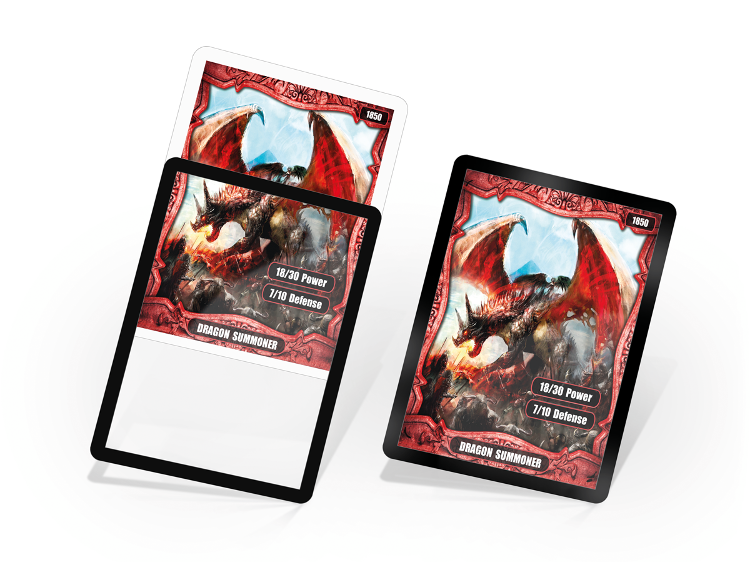 The product was a perfect-size plastic sleeve which adds a border in black, silver, or various colours to Magic cards. In December of 2015, we agreed on a deal with Ultimate Guard, who have picked up the Bordifies brand for national and international distribution and are continuing the Bordifies business. Peer’s first start-up, Bordifies, adds a border to trading cards. Illustration: Peer Richelsen. After that, I was at a crossroads. Bordifies had taught me that I risked spreading myself too thin by running a start-up while in college. The question for me was whether I should continue my studies full-time or pursue a new project – the one that later became Snapcardster. 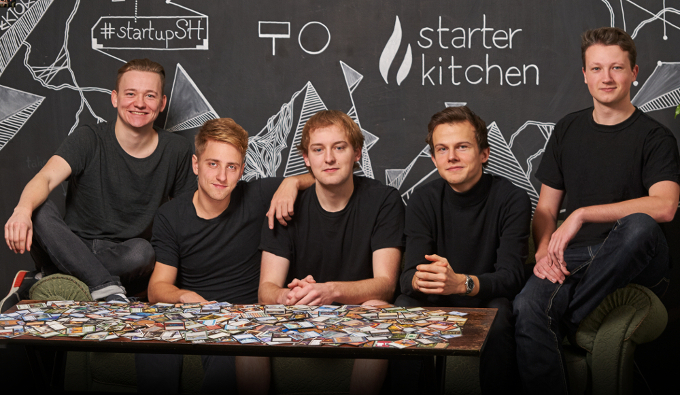 Then, in March 2016, I attended the Prototyping Week organised by Starterkitchen, a coworking space from Kiel. During Prototyping Week, I was thrilled by the interest my idea generated and by the know-how that the other participants brought to the table. That led me to go ahead and found Snapcardster. So who’s working on the app today? Our team consists mainly of former computer science co-students of mine. Not all of them are Magic players, but everyone on the team is one hundred percent behind the idea. Developing an app as complex as Snapcardster and getting it to run reliably on all Android systems requires a lot of expertise and effort. One person alone could never get that done. Peer, Julian, Malte, Nico, and Christian. Image: Snapcardster. The founding members are Malte, Nico, and myself. We were able to offer three spots for Computer Science bachelor theses. Tim, a Magic judge from Kiel, is supporting us locally and on social media. Bennet, our Java developer, joined us for the Kickstarter campaign. In addition, we will hire an iOS developer soon. I am the only person on the team who is full-time. After all, college can be paused for a while, but a company can’t. Every start-up needs at least one full-time employee, so all my energies are focused on Snapcardster right now. 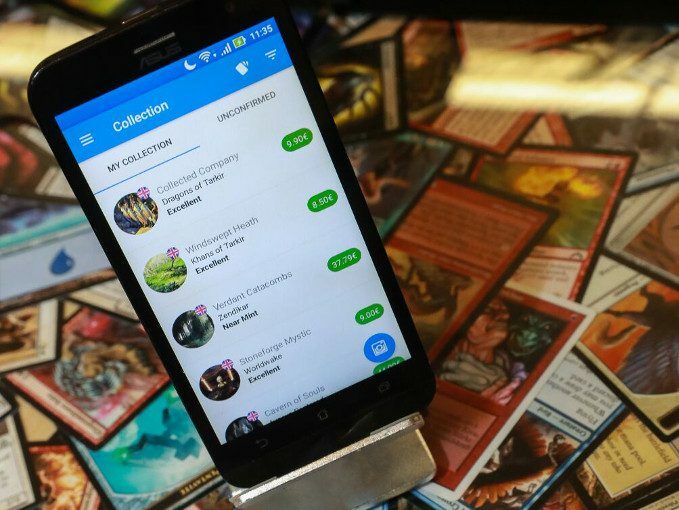 How do you secure financing for a Magic: the Gathering app? It’s not exactly the best elevator pitch. We were able to get initial financing from a state initiative called Opencampus.sh. This enabled us to create three part-time jobs for two months and get to work on a sustainable concept. From there, we were able to launch a closed beta. After three months of beta testing, the app was mature enough to go ahead with our Kickstarter. For the Kickstarter, we created a short clip explaining all of Snapcardster’s goals and features. We also used our own personal contacts into the German Magic scene in order to promote the app and took to promoting the idea on Reddit. You can generate a lot of attention and feedback online – not all of it pleasant, but it certainly helps you grow. Your Kickstarter ended up raising a little over 6.000 Euros in five weeks. I hope those weren’t just your grandmothers pitching in. There might have been a few grandmothers among our backers, but the bulk of our financing came from Magic players all over the world. That was really encouraging, because in addition to raising funds, the Kickstarter aimed at raising awareness and growing the user base. Many players contributed, but even more supported us by installing and testing the beta. We not only needed crowdfunding, but also crowdsourcing. One of the main challenges for a scanner app is having a database. If a user scans a card, the app has to be able to compare it to something. Our beta testers helped us create that database. They scanned their cards and then named them. This is a black-bordered Underground Sea, that’s a Knight of the Reliquary etc. We then verified every single scan by hand and fed the data to the software to enable it to recognize cards automatically. A rewards system helped us fill the database. The thousandth scan of a Forest creates no additional value, but cards which had not been scanned at all or a lot yet were rewarded with “Snapcoins”. Where there’s coins, there’s a business model. How will Snapcardster monetize the app? First things first: the app itself is free and will continue to be free. With Snapcoins, we want to enable access to comfort features and premium features. In the medium term, we want to enter into good partnerships with other Magic services and offer advertisements on Snapcardster, for example. After all, the Kickstarter can only cover development costs for a while. Trading, premium, “other Magic services”… all of this begs the question: How’s your relationship with magiccardmarket? I think that Snapcardster is too small to speak of a relationship of any sort. We had brief contact regarding integration of pricing data and the MKM Series Trial tournament, but nothing else. We’re not competitors anyway. Our app is focused on community aspects, as well as local trading. 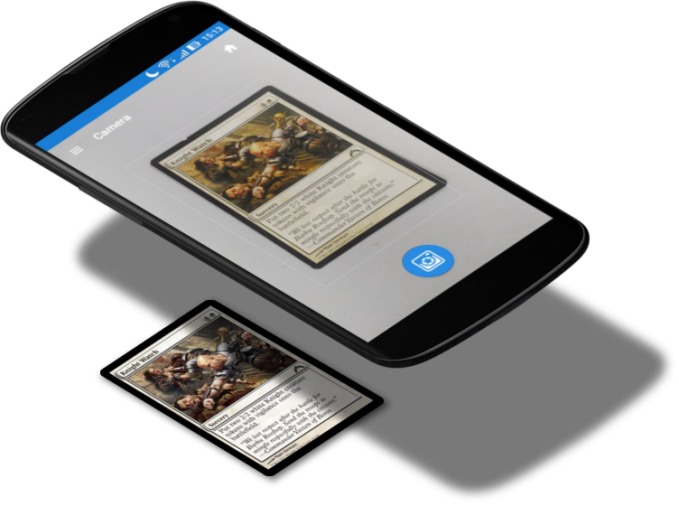 Magiccardmarket, on the other hand, wants to establish a marketplace for trading with players all over Europe. You’re cooperating for the Snapcardster tournament on July 1st, which will be a Trial for MKM Series Hamburg in September. The reason is simple: We want to support the local community and we’re participating as well. With the tournament, we want to generate attention for Snapcardster and thank the community for the support so far. We did something similar in 2015 upon launching Bordifies. That’s why the tournament will take place at the Starterkitchen coworking space: We’re inviting players into our office. You have announced cash prizes for the tournament, which is unusual in Germany for legal reasons. How’s that possible? We covered our bases on this issue. Compared to other German states, the legal situation in Schleswig-Holstein is different. We have contacted the proper authorities and obtained an assurance that Magic is not treated as a game of chance, but rather as a game of skill – like chess, for example. That distinction paves the way. Offering cash prizes instead of card prizes makes the event organisation more flexible. I cannot remove ten percent of a card because five less players showed up. The tournament website has a button which calculates the dynamic payout for any number of players. This creates transparency. Since the event’s goal is to generate attention, we do not aim at turning a profit anyway. It’s a launch party for Snapcardster. “Launch party” sounds like you’re done with development. However, your website lists several upcoming features, such as deck statistics, a messenger and a payment function. We’re continually expanding Snapcardster. I’m always brainstorming new things to integrate into the app. Most of this is still guided by features I would like to use as a player. This way, we implement some unusual features as well. Our trading system, for example, is basically “Tinder for Magic cards”. The feature is designed for tournaments with hundreds of players in the room. The app can display all cards players have put up for trading for you to decide: not interested, not interested, interested. That’s just more fun than combing through fifty trade binders. And then the app helps you find that person to trade. Trading with Snapcardster. Illustration: Snapcardster. Players importing their trading cards and collections are sharing information about thousands of dollars in value. So let’s talk data security. We don’t save any location data or addresses. We do not even save real names if you just want to enter a user name. We also guard all Snapcardster data on a secure server in Germany. Much like Facebook or other social media, our privacy settings enable you to choose who can access your collection – everyone, your friends, or no one. Players who just want to manage their cards can do that without sharing any sensitive data. After all, Snapcardster has been designed to make our shared hobby easier. As you can see, Peer and the Snapcardster crew are not wanting for ambition. Let’s see whether they’re able to meet their lofty goals. As of now, Snapcardster has been downloaded over 1.000 times on the Google Play store. I’m going to test the app shortly and report on how it fares in practice. Ich verstehe immer noch nicht, warum hier alles auf Englisch ist. Wird es bald endlich auch eine Version für iOS geben? I can’t find this app in the app store. Can someone help? It’s still on google play tho…? du hast mir bei Facebook nicht geantwortet. Wann kommt endlich die Kauffunktion? Thanks for the article! Hope your startup idea works! I was told that there would be an update soon! is this the same Peer Richelsen who just went Top 8 at MKM Hamburg?